In Microsoft Word how can I link to an image from the web which updates? Is it possible in Microsoft Word (Word 2003 preferably) to insert an image from a url and have that image reloaded from url each time that document is opened? The image itself is a map, and I'd like the map to be reloaded from the server each time the Word document is opened so that the most recent image is displayed. In Field Names, select "InsertPicture". In the field "Filename or URL", put the URL to your image. Check "Data not stored in document". And eventually the 2 "Resize..." checkboxes if the size of the online image can change. I got here looking for a way of adding my StackOverflow flair in my CV/resume. Since reputation and badges change frequently I wanted it to be updated/reflected automagically in the Word doc. I happen to be using Word for Mac 2011. On the left in Categories: select Links and References. In Field names: select IncludePicture. Now you have to type two quotation marks in the input box just after INCLUDEPICTURE. Click Preserve formatting during updates if you want. That's it. Now the flair will be updated automagically wherever i open the Word doc. Totally AWESOME. 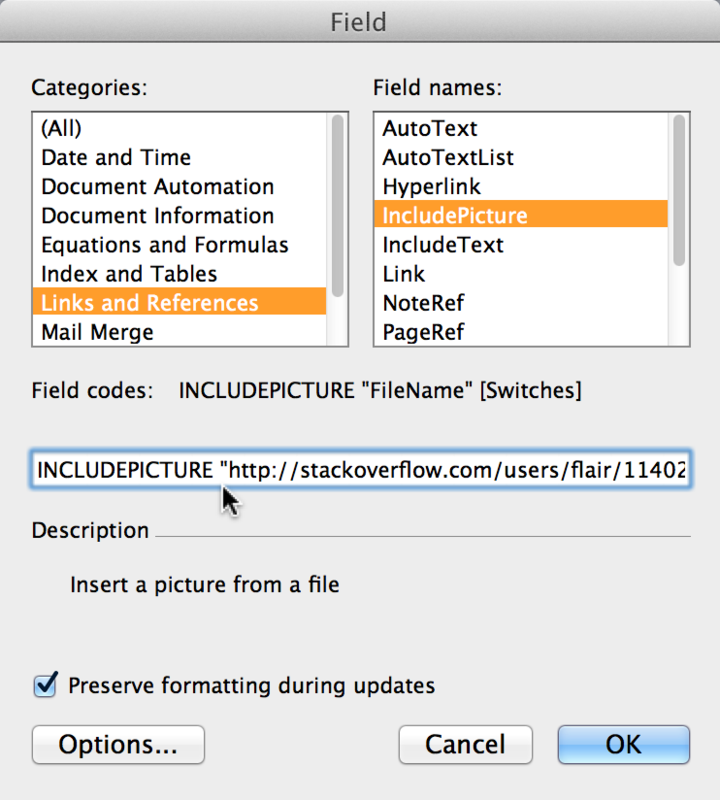 In Word 2010 instead of "InsertPicture", the field name is "IncludePicture"
You can choose Insert -> Picture -> From File... and type in the URL, but I'm not sure if it auto updates (not sure it can do that). In MS word 2013 (using gdrive picture). If you want to add an email but you don't want to update the image (when the hosted email will change) go to insert tab, click on pictures, simply past the url of your image in the filename field and press insert. If you want the picture to be updated go to insert tab, click on pictures, simply past the url of your image in the filename field but instead of pressing insert, chose (in the menu under insert) insert and link (or link to file. Both will work). To update a gdrive file, just drop the new version on the new one. Google will ask you if you want to keep separate, let it go, by default it will update the old one. How to update/refresh a linked picture in the docx?. Select the picture and refresh by pressing F9. Can you turn on macros or VBscript? If not I don't think Word handles files dynamically like that it saves them to the doc file. Not the answer you're looking for? Browse other questions tagged images microsoft-word web or ask your own question. How to ALWAYS link an image in MS Word 2010 instead of embedding it? How to stop Word 2007 from overlapping images? MIcrosoft Word 2003 - Can you import heading styles from other Microsoft Word documents? Can I export a PNG image from Word? How can I place images from Excel into Microsoft Word? How do I open the Document Map in Microsoft Word? How to insert a light gray line in Microsoft Word?